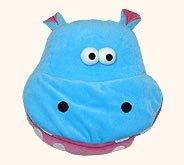 Specially liked at zoos by kids at large but if the hippo theme is incorporated in the furnishings at kids room, it behold their attention to a great extent. Creating an attractive ambiance for the kids, which can behold the kids in their rooms for long, our theme based furnishings have become one of the popular preferences of people at large. The choice of fabric material in the theme based furnishing and the use of colour is done to utmost perfection. 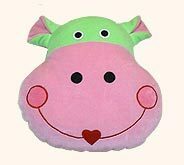 Desc : Soft toy hippo portrays green colored head and pink muzzle. Lovely and friendly smile on his face will definitely capture the heart of every little one. 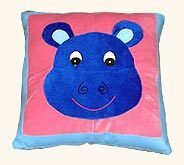 Desc : Blue colored this affectionate hippo on pink pillow is keenly waiting the moments , when kids will come to sleep & he will provide them full comfort and hum a sweet lullaby in their ears. Desc : Leaving his ever dwelling place rivers, green little hippo has come to live with lovely children. 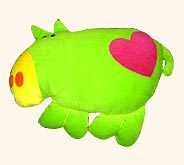 His small four legs has got tired & yellow snout has bent but his heart is full of love, which can be explored through pink heart mark on his bottom. Desc : This green & yellow colored baby hippo looks naive & innocent from his facial expressions. But among kids, he comes to mischief. 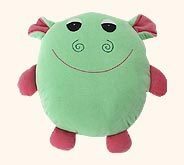 He tickles kids with soft fabric, plays with them & sleeps in their cradles carelessly. Desc : A new playmate for the darling babies, who love to heehaw a lot. 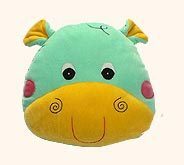 This baby hippo toy has green colored large and chubby belly to endow the babies snug & pleasure with his soft touch. Desc : This light blue colored adorable hippo follows the social etiquettes very well, as he dreams to live amongst the group of civilized kids. For this reason, he has worn pink and blue trousers & now he is proudly smiling on his intelligence. 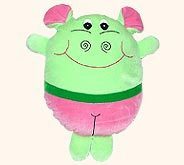 Desc : Spreading his short arms, this extremely happy green & pink hippo is cordially inviting the little ones- ' come on! Be my friend '. Expressing this feelings, embroidered lines are really appreciable. 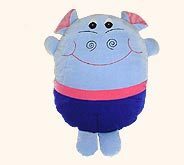 Desc : Artistically colored in blue tint, this soft toys hippo will make children's everyday special. They can interchange glances peeping into his eyes, twist his both ears mischievously and feed the morsel with love.